Ireland will go to Twickenham on Saturday March 17 seeking only a third Grand Slam in 70 years. Record-breaking Ireland set up an all-out assault on the NatWest 6 Nations Grand Slam by claiming a 28-8 bonus-point win over Scotland in Dublin. Jacob Stockdale bagged a brace to become the first Irishman to score six tries in a single campaign in Five and Six Nations history, as Ireland moved within one win of just a third-ever clean sweep. Conor Murray and Sean Cronin also crossed to secure the bonus-point victory that could even see Joe Schmidt's men claim the Six Nations title with a week to spare. Unless England could claim a bonus-point win over France in Paris, Ireland would be crowned champions on Saturday night. Schmdit's class of 2018 also set a new Ireland record with an 11th consecutive victory, their winning run dating back to last term's 13-9 win over England in Dublin. 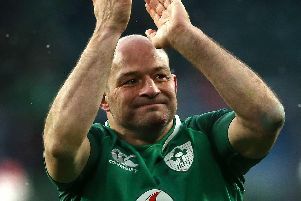 Even if Ireland were to seal a third title in five years with a week to play, Schmidt's side only have eyes for one prize now - a first Grand Slam in nine years. Their previous success was 70 years ago - the anniversary of which is Tuesday, March 13.